For once, I am not writing about expeditions, ecology or wildlife – but about the city of Iquitos in the heart of the Peruvian Amazon. Why? Because I loved it! 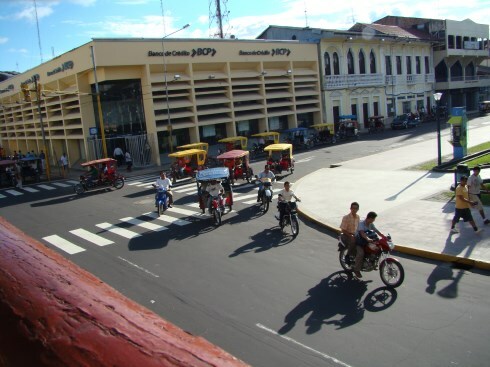 Iquitos is the largest city in the Amazon Rainforest and the sixth largest city in Peru. It lies at the heart of the north-eastern Loreto region of the nation. It is accessible only by aeroplane or boat, and in 2010 I was lucky enough to spend one week in the city whilst undertaking research in Pacaya Samiria National Reserve. 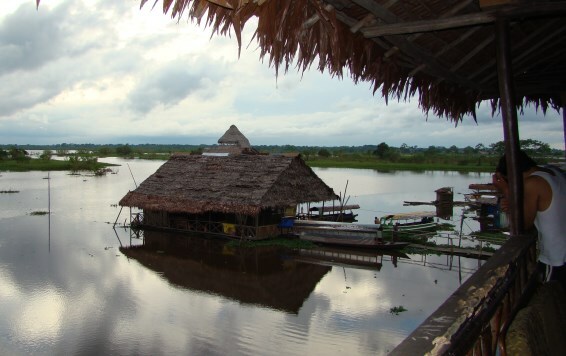 Iquitos was founded in 1750 by Jesuit settlers who were trying to convert the indigenous tribes, but with little success. It slowly grew and by the 1870s it had 1500 inhabitants. 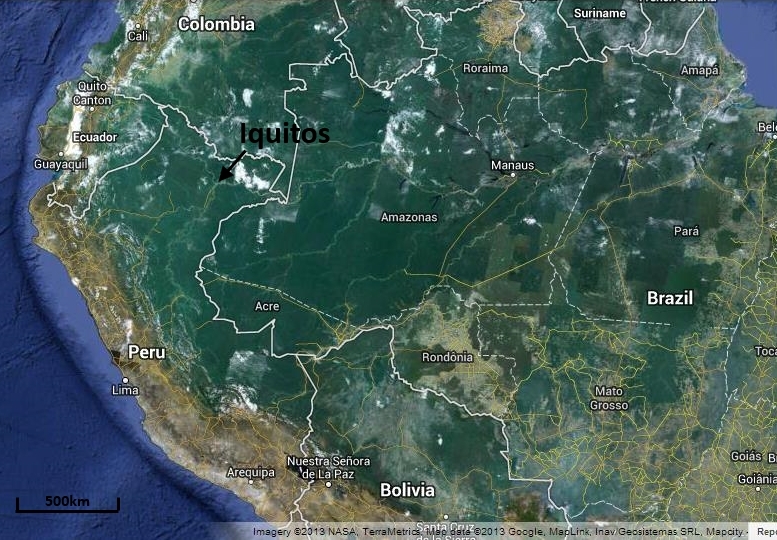 Over the following ten years the population increased 16-fold due to the importance of Iquitos during the rubber boom. Over the next 30 years the city was injected with wealth as rubber barons grew grossly rich but concurrently local tribespeople became enslaved as rubber tappers. By WWI however, the rubber boom vanished as quickly as it had appeared, due to the work of a crafty British businessman who planted rubber plantations in the Malay Peninsula. It became much easier to collect rubber from plantations than from the rainforest itself. Iquitos continued to export a few forest products and then in the 1960s oil was discovered and wealth once again returned to the city. Today, tourism provides the greatest revenue in the city and it is not difficult to see why. Upon stepping out of the airport I was overwhelmed by the heat and humidity in comparison to the capital city of Lima; this in itself can make a destination for me. I love the sun, heat and humidity of tropical countries. I actually feel healthier in mind and body after a few weeks in the warmth. Perhaps this has something to do with the origin of our ancestors? We were staying at La Casa Morey, a boutique hotel right on the Amazon river bank, three blocks to the north of Plaza de Armas and at the very centre of Iquitos. Approaching the city centre from the airport you first notice the wide roads lined with workshops, then grocery shops and street vendors, before finally reaching the city centre where an assortment of shops, restaurants and public services dominate. During daytime hours the streets are filled with tuk-tuks. These are manufactured in Iquitos from parts brought in by boats and there are fewer conventional cars due to the difficulty of manufacturing them in such a remote city. 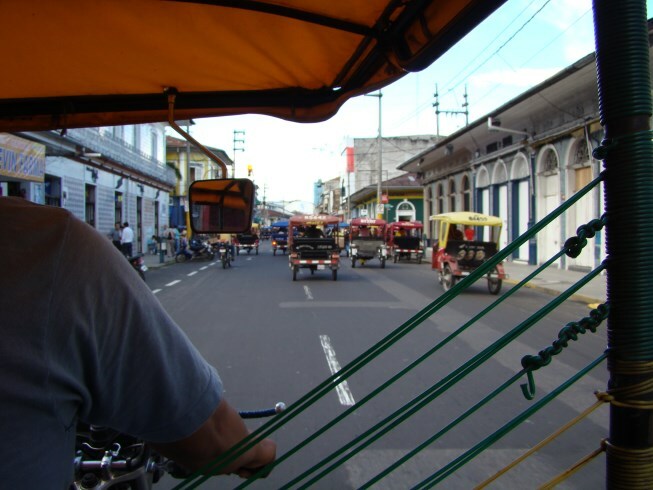 Over the days spent in Iquitos, we started to tap in to key places and landmarks in the city centre. 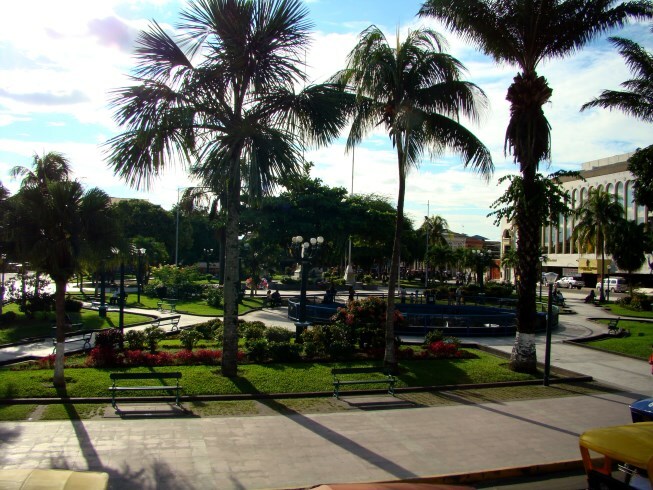 Plaza de Armas is at the very centre of the landmarks near our hotel. Ari’s Burger restaurant became a familiar favourite. One block to the east brings you to the river side walkway of Boulevard Joaquin Abensur; lined with restaurants, floating bars and the Mercado Artesanal Anaconda; a network of small souvenir shops floating on the river itself. By day this area boasts stunning views across the Rio Amazonas, colourful souvenir stalls and local delicacies, and by night the comfortable humidity, bustling street vendors and colourful lights of the boulevard make it a very magical place indeed. 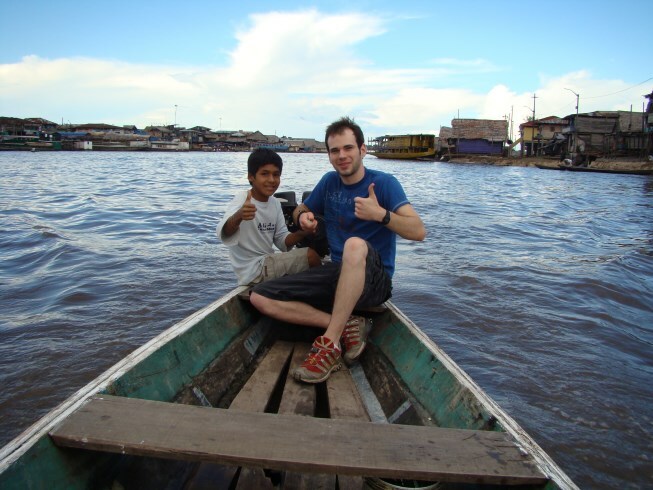 We made a couple of excursions away from the city centre during our time in Iquitos. One trip, I would highly recommend took us to the Amazon Animal Orphanage and Pilpintuwasi Butterfly Farm which can only be reached by small outboard powered boat. 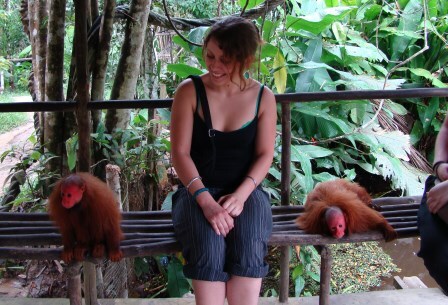 The Amazon Animal Orphanage is designated by the Peruvian Government as a “Centre of Custody” for rescued wild animals. 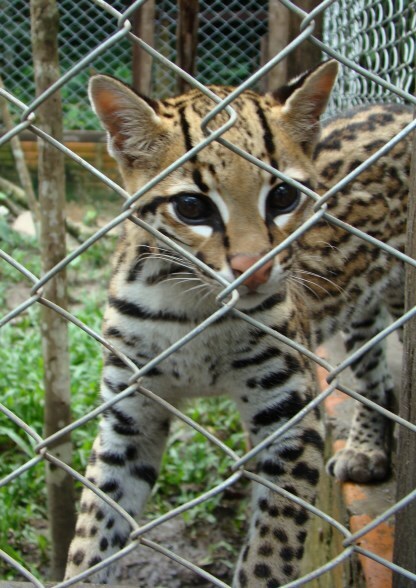 It is here that you can get a chance to see the most elusive of the rainforest creatures like Ocelot and Jaguar. At Pilpintuwasi you can see the complete life cycle and development of native forest butterflies, learn how they are cared for and walk through their butterfly house (which is more of a cage because the climate is perfect). Our second trip took us South through the city to Belen market and the floating village. Belen market is where rainforest communities come to sell wild-sourced products to the city. It must be experienced. The narrow alleyways, filthy and smelly, are packed with tiny stalls selling dead and live animal products (including jaguar parts), bush meat, forest fruits, rice, grains and beans, herbs and medicines, tobacco, bottles of home-brewed rum; the list goes on. It is incredible to see the variety of products that can be obtained here, and the volumes in which they have managed to be sourced on such a subsistent level. These people are poor, but they seem happy. Personal security is top priority here, so keep your wits about you. A young boy then took us on a short canoe ride from Venice Street along the river to see the floating villages. The water level of the river fluctuates annually by eight metres, and these wooden huts and houses float up and down with the seasons every year. We even saw a floating bar and club. If you have come all the way to Iquitos, although the city itself is worth the visit, you should probably enter the rainforest… We took a research vessel from Nauta, a small town 100km to the South of Iquitos and steamed along for two days in to the heart of the Pacaya Samiria National Reserve. Here I spent five weeks collecting data on dragonfly communities. It is within this reserve that the Maranon and Ucayali rivers converge to form the beginning of the Amazon River, proper.